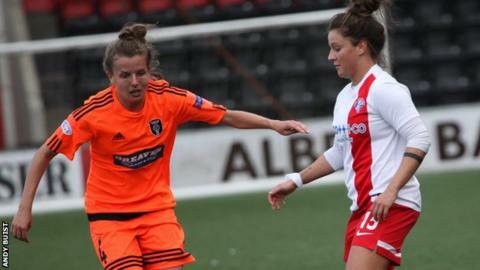 Second-half goals from Leanne Ross and Hayley Lauder earned Glasgow City a 2-0 Scottish Women's Premier League victory over Spartans on Sunday, keeping them atop the league standings. Captain Ross converted a penalty following a hand-ball. And Lauder headed home a Nicky Docherty cross just two minutes later. With three fixtures remaining, City lead second-place Hibernian by three points - the two sides meet next Sunday at Albyn Park. The Hibees beat Celtic 2-1, with wins also coming for Rangers, Hamilton Academical, Stirling and Inverness City. "I knew that we would have to work for our victory today as Spartans made it difficult for us last time," said City head coach Scott Booth. "For the first period of the game we didn't pass the ball well enough, we allowed the opposition to regroup and we didn't have enough quality around the box to trouble them - it was unlike us not to have that part of our game on song. "We had more conviction about us in the second half and we kept the ball better. It was good that we got the reaction in the second half and good that we took a couple of chances, and it could have been more, but we need to start games better."